Mexico ( i/ˈmɛksɨkoʊ/; Spanish: México; IPA: [ˈmexiko] ( listen)), officially the United Mexican States (Spanish: Estados Unidos Mexicanos (help·info)), is a federal constitutional republic in North America. It is bordered on the north by the United States of America; on the south and west by the Pacific Ocean; on the southeast by Guatemala, Belize, and the Caribbean Sea; and on the east by the Gulf of Mexico. 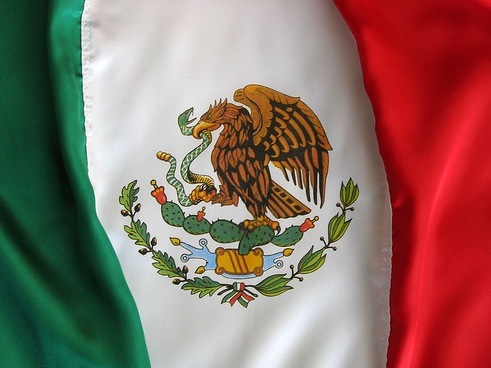 Covering almost two million square kilometres (over 760,000 sq mi), Mexico is the fifth largest country in the Americas by total area and the thirteenth largest independent nation in the world. With an estimated population of over 113 million, it is the world’s eleventh most populous country and the most populous Spanish-speaking country. Mexico is a federation comprising thirty-one states and a Federal District, the capital city. In pre-Columbian Mexico many cultures matured into advanced civilizations such as the Olmec, the Toltec, the Teotihuacan, the Zapotec, the Maya and the Aztec before first contact with Europeans. In 1521, Spain conquered and colonized the territory from its base in México-Tenochtitlan, which was administered as the Viceroyalty of New Spain. This territory would eventually become Mexico following recognition of the colony’s independence in 1821. The post-independence period was characterized by economic instability, the Mexican-American War and territorial cession to the United States, a civil war, two empires and a domestic dictatorship. The latter led to the Mexican Revolution in 1910, which culminated with the promulgation of the 1917 Constitution and the emergence of the country’s current political system. Elections held in July 2000 marked the first time that an opposition party won the presidency from the Institutional Revolutionary Party. Since 2006 the country has been in the midst of a drug war which has caused 60,000 deaths.